While the dream of owning a luxury yacht is only a reality for the affluent few, the experience of cruising on one for a couple of weeks can be a reality. Monocle Yachts, based in Fort Lauderdale, FL., has a fleet of vessels in ports around the world that are part of a fractional ownership program administered by the company. Dr. Loren Simkowitz, president, says, “most people who own yachts only use them for two to four weeks a year and they cost a lot of money to own, staff and maintain. Our company oversees the crew, maintenance and concierge services for the yachts around the world. We can offer unused weeks to small intimate groups who want the lifestyle experience without the upkeep.” There are 50 yachts available at certain times for small groups of eight to 10 people. Dr. Simkowitz says the flexibility of these yachts is part of the allure. “They cruise whenever and wherever they want to go, they have more flexibility and guests don’t have to be back at 5 p.m. to accommodate a cruise ship’s schedule. Their smaller size allows them to visit smaller coves and deserted beaches that are out of reach for larger vessels.” He adds, “When we have a larger group, they spend their days on the yacht and spend the nights in a close-by hotel or we put several yachts together in a flotilla arrangement.” Most of the yachts are in the 80- to 100-ft. range and have a crew of four, including a chef, and carry a variety of water toys such as jet skis, paddleboards and floats. Most have three to four staterooms but some have up to six. Yachts are based in the Caribbean, Europe and the South Pacific. Monocle Yachts are represented in Canada by Liz Akey, executive director of EMA Marketing, based in Oakville, Ont. 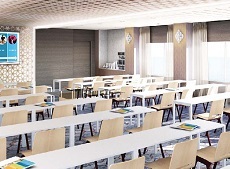 Touting cutting-edge design, the Celebrity Edge cruise ship features several new meeting options that may attract new group converts to sea. The Meeting Place is a 1,970-sq.-ft. venue featuring flexible soundproof dividers, a variety of seating options, private office space for event planners and a fully equipped pantry with mobile bar stations. State-of-the-art audiovisual systems and awe-inspiring views from a central deck location make meetings collegial and appealing. Designers added comfortable lounge seating to transform the space from day to night. 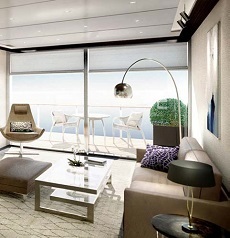 Other venues on board feature the Magic Carpet, the world’s first cantilevered floating platform outside of the ship’s hull, a Rooftop Garden and the green living room Eden. The Celebrity Edge is scheduled to take its maiden voyage in December 2018.